Bite-sized chocolates and candies are everywhere and virtually unavoidable. They’re up for grabs at your job, local café, and barber. There may even be a basket of them at your health club. And now that Halloween has passed, you might have taken advantage of the half-price sales and even have a bag of mini-chocolate bars in your cupboard. If you’re experiencing stress, this time of the year can be tough on your waistline. With all the bite-sized candy around, it’s easy to overeat; they offer the perfect, sweet, fatty snack you might crave in times of stress. But if you’re an emotional eater, leave the candy on the store shelves and in the complimentary baskets. There are healthy ways to snack during stressful periods that can give you the flavors, textures, and satisfaction you desire. Here are a few items you can keep handy to help you pass up those tempting treats. A popular stress snack is ice cream; it has everything your body is craving, including sugar, fat, and a creamy texture. A great substitute is plain Greek yogurt. This healthy treat offers the creaminess you crave, while the addition of berries, honey, and nuts can provide the sweetness, texture, and fat your body wants. The benefit: it’s all healthy, quality calories that trigger the release of nuerotransmitters to make you feel good. So, in addition to calming your stress, you get energy and strength from protein and calcium, antioxidants from berries, and healthy fats from nuts. (Just make sure you stick to only a handful of nuts to keep calories in check!) The bonus: some Greek yogurts are fortified with probiotics that can help calm your stomach. Smoothies are a healthy, tasty way to take care of stress. Simply pour some almond or skim milk into your blender, add a few ice cubes, a banana or some berries, and some ground coffee, and voila! This milkshake substitute will release dopamine (from the coffee) to make you feel good and potassium (from the banana) to help lower blood pressure. 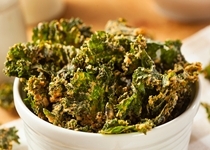 When you’re in need of a salty, crispy snack, reach for some homemade kale chips. In just a few easy steps, you can have carotenoid-filled kale that can help you feel more optimistic with a serving of olive oil that leaves you feeling satisfied from a boost of serotonin. Simply take some fresh kale, drizzle it with olive oil, and toss it with some salt (if desired). Spread the kale in a single layer on a cooking sheet and bake for 20 minutes. This snack is great for carrying with you in a Tupperware container to satisfy cravings when stress hits while you’re on-the-go. I know it sounds like a traditionally unhealthy snack, but the “dark” part is the important point that adds some nutritional value. That said, it’s extremely important to limit serving sizes to a quarter or third of a cup; the calories in this tasty treat add up in a hurry. Having said that, the dark chocolate (at least 85% cocoa) can reduce stress hormones and blood pressure, while the almonds provide protein and healthy fats associated with lower rates of depression. So the next time you’re feeling stressed, avoid reaching for the traditional treats during an emotional eating session. Prepare these tasty treats in advance to satisfy cravings and reduce stress in a healthy way. Augustine, G.J., “How does calcium trigger neurotransmitter release?” Current Opinion in Neurobiology, June 2001; 11(3)” 320–6. Walker, J., “Identification of coffee components that stimulate dopamine release from pheochromoctoma cells (PC-12),” Food and Chemical Toxicology February 2012; 50(2): 390–8, doi: 10.1016/j0.fct.2011.09.041. “Potassium Lowers Blood Pressure,” The Harvard Medical School Family Health Guide web site, July 2005; http://www.health.harvard.edu/fhg/updates/update0705c.shtml, last accessed November 5, 2014. American Chemical Society, “New evidence that dark chocolate helps ease emotional stress,” ScienceDaily web site, November 12, 2009; http://www.sciencedaily.com/releases/2009/11/091111123612.htm, last accessed November 5, 2014.